A Russian MiG-31 jet flew within 50 feet of a U.S. surveillance aircraft in Northeast Asia last week, Moscow’s latest aerial saber-rattling against American ships and planes, according to defense officials. "On April 21, a U.S. Navy P-8 Maritime Patrol reconnaissance aircraft flying a routine mission in international airspace was intercepted by a MiG-31 Russian jet in the vicinity of the Kamchatka Peninsula," Cmdr. Dave Benham, a spokesman for the Pacific Command, told the Washington Free Beacon. Benham said the intercept was "characterized as safe and professional." "Intercepts between the United States and other militaries occur often and the vast majority are professional," he noted. "For intercepts that are deemed unprofessional, the U.S. takes appropriate measures through military and diplomatic channels." A defense official familiar with the MiG-31 intercept said the jet flew within 50 feet of the P-8, a maritime patrol and anti-submarine warfare aircraft. The incident took place near the Russian city of Petropavlovsk-Kamchatsky, a port located on the southeastern end of the peninsula. Kamchatka is Russia’s main military hub in the Pacific and the focus of a buildup of Russian military forces that Moscow has said is intended to match the U.S. military rebalance to Asia. Several military bases are located there, along with a major naval base. The peninsula is also the main impact range for Russian missile flight tests launched from the central part of the country. The latest aerial incident involving a Russian jet followed two dangerous encounters over the Baltic Sea last week. A Russian Su-27 flew within 50 feet of an RC-135 reconnaissance aircraft on April 14 and executed a barrel roll over the surveillance plane in what the Pentagon called an "unsafe and unprofessional manner." Two days earlier, two Russian Su-24s buzzed the guided missile destroyer USS Donald Cook, coming very close to its deck as the warship sailed in the Baltic Sea. The Pentagon protested both incidents. On Capitol Hill, Defense Secretary Ash Carter told a Senate hearing on Wednesday that the recent incidents are an indicator of "tension that has built up in Europe especially over the last couple of years since events in Crimea and Ukraine." On the recent buzzing of the Cook, Carter said "it is unprofessional behavior, and whether it is encouraged from the top, whether it was encouraged from higher up or not I can't say." "But we do expect it to be discouraged from higher up from now on," he added. "These pilots need to get the word, ‘Hey, knock it off. This is unprofessional. This is dangerous. This could lead somewhere.’"
Carter, appearing before the Senate Appropriations Committee, said the recent incidents were "dangerous" and could have led to a conflict, noting that "we can't be accidentally stumbling into something." The P-8 flight appears to have been part of an effort to spy on Russia’s deployment of a new missile submarine at Petropavlovsk. Adm. Harry Harris, commander of the Pacific Command, told a Senate hearing in February that Russia is building up its military in the Pacific, where Moscow’s Far East forces had declined sharply after the collapse of the Soviet Union in 1991. "Russia continues modernizing its military forces, homeporting its newest Dolgurukiy-class ballistic missile submarine in Petropavlovsk, and revitalizing its ability to execute long-range strategic patrols, highlighted by last July’s deployment of Tu-95 Bear bombers near Alaska and California, and last month’s bomber flights around Japan," Harris told the Senate Armed Services Committee Feb. 23. Retired Navy Capt. Jim Fanell said the close-in MiG-31 intercept is significant. "The 50-foot closest point of approach by Russian Far East MiG-31 Foxhound interceptors to a U.S. Pacific Fleet P-8 reconnaissance flight is an indicator the Russian Navy has likely transferred their first Dolgorukiy-class SSBN to the Pacific Fleet," Fanell said, using the acronym for ballistic missile submarine. The new missile submarine, armed with Bulava nuclear missiles, marks a significant upgrade of Russia’s aging fleet of Delta III missile submarines. The arrival of the first Dolgorukiy "places an additional ‘hold at risk’ tasking on the U.S. Pacific Fleet which has also had to account for the introduction of [People's Republic of China] Navy JIN-class SSBN patrols in 2015," Fanell said. The need to monitor new Russian missile submarines adds to the already overloaded requirements for U.S. submarine forces. "This clearly represents another clear and present danger to U.S. national security," Fanell said. The "nation needs more ballistic missile and fast attack nuclear submarines, and fast." 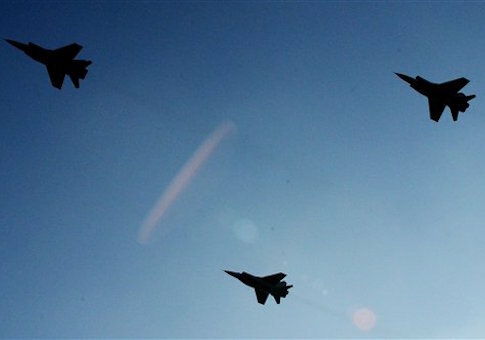 A Su-27 in January flew within 20 feet of an RC-135 over the Black Sea in a dangerous maneuver. Last October, the Russians used threatening aerial maneuvers against the aircraft carrier USS Reagan in the Sea of Japan. Two Russian Tu-142 bombers made low passes near the aircraft carrier near the Korean peninsula. Earlier, on July 4, 2015, two Tu-95 nuclear-capable bombers flew within 40 miles of the California coast prompting intercepts by U.S. jets. Moscow also has sent Tu-95 bombers to circumnavigate the Pacific island of Guam on several occasions. The island is a major military hub and central to the U.S. military’s pivot to Asia. The Russian navy’s Pacific Fleet conducted exercises in the Sea of Japan on April 22, a day after the P-8 was intercepted, according to a Twitter search. Russian naval forces from Kamchatka also carried out missile and artillery fire exercises in recent days. The military activities may have been a target of the P-8 surveillance operations.